We know how important compliance is to our customers and have been tracking the regulations since they were first proposed. Earlier versions of Genesis R&D had a watermarked proposed label available. ESHA Research has incorporated FDA’s finalized Nutrition Facts regulatory and layout changes into the Genesis R&D Product Development and Labeling Software and will be showcasing the new label and related software features at this year’s IFT Food Expo in Chicago, Illinois. Genesis allows users to easily convert the analysis and labeling for their food products and formulas into the new format, which puts more focus on Calories and makes Vitamin D, Potassium, and Added Sugars mandatory. 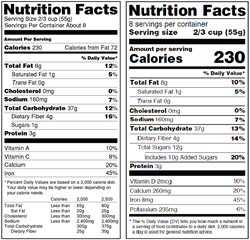 In addition, the program’s database has been updated to reflect the revised Daily Values for certain nutrients, and foods and ingredients have been populated with Added Sugar values. In addition, ESHA Research will be demonstrating the new Genesis R&D Supplement Formulation & Labeling software at the show, which also incorporates the updated FDA supplement facts label format. Visitors to the ESHA Research booth #1318 will be able to demo both programs and experts will be on hand to answer any questions. ESHA Research, founded in 1981, offers a variety of nutritional analysis and labeling solutions to ensure regulatory compliance and simplify product development. Our software programs and databases have been used all over the world by food manufacturers, educational facilities, restaurants, healthcare facilities, and other industry organizations for nutrient analysis, labeling, product development, and more. In addition, ESHA Research offers software and regulatory-compliance consulting and label-generation services.